Who provided first-hand eyewitness accounts of the resurrected Jesus Christ? Vic Batista: Some people today would rather believe in fables than the truth of the Word of God. And yet, right there in verse 16, Peter talks about how he was an eyewitness to the life, death and resurrection of Jesus Christ. Verse 16 reads again: "For we did not follow cunningly devised fables when we made known to you the power and coming of our Lord Jesus Christ, but were eyewitnesses of His majesty." Nathan Jones: Eyewitnesses are very important to the Gospel. This is isn't Mohammed sitting all alone in a cave claiming that he saw an angel come and give him his directive. This isn't Joseph Smith sitting alone up on a mountain claiming an angel gave him golden tablets. This isn't just one guy out there claiming that he saw some miracle. But, in Christianity we have eyewitness accounts. We not only have the 12 Apostles, but all the 500 or so disciples. Some 500 people testified to Jesus being resurrected from the dead. They actually saw Jesus after He died. We have historians from that time period who reported the fact that there was news of Jesus being resurrected. When Paul talked to various Roman officials he said, "This isn't something you've never heard before. The story of Jesus' resurrection is widely known." The testimony to Jesus Christ being the Son of God, was crucified and resurrected, and lives today had first-hand eyewitnesses. Biblically you only needed two witnesses to substantiate a story, but here we have well over 500 who were there to see Jesus alive in the following days. And, to top it off, when these witnesses went out and shared the message of Christ resurrected, they were willing to die for that message. Now how many people are willing to die by excruciating pain for a lie? Vic Batista: That is an excellent question, because I know I wouldn't. I had friends who always said, "I've got your back." But, once trouble started, I would turn around and realize that no one was left. Nathan Jones: The Apostles all died horribly. As a matter of fact, this passage is Peter's last message. Previous verses talk about him approaching death. Peter was crucified upside-down. Crucifixion is the most painful death, and the Roman's knew how to use it well. Peter was willing to die on the cross for the fact that he knew the truth of Jesus Christ. Such a testimony means something! People don't die for a lie; they die for the truth. Every one of the Apostles except for John died a horrible, gruesome death because they wanted to share the Gospel. They believed in Jesus whole-heartedly. They knew what was the truth, because they were eyewitnesses of what had happened. Vic Batista: People die for the truth. We have Christians being killed right now in different parts of the world. They are dying for the truth of Christ resurrected. Nathan Jones: Yes, they are not dying for a lie. They are dying because they believe that Jesus Christ is their Savior. Something happened in their lives called salvation. It changed the lost and sinful person they once were into a new life redeemed by Christ. They know Jesus first-hand by the Bible and the Holy Spirit. They know without actually physically seeing Jesus that He is the real deal, and they are willing to die for that truth. Vic, I hope when the time comes you and I are willing to die for the truth of Jesus Christ as well. Vic Batista: I encourage people to see Bible prophecy as a light in the darkness, for people need to recognize the darkness persecution is coming. It is even now at the door of our country. We as Americans could possibly come to that point where, like Christian in the Middle East, we end up being put in that position where we have to make a decision to stand up for Christ. Nathan Jones: Certainly the political pressure is increasing against religious freedom as the country sides with unbiblical teachings. For example, look at the outcry when the state of Indiana passed the same law that already exists as a federal law and is on the books in 30-some other states which restates the right of the First Amendment's freedom of religion. The entire country went berserk over Indiana daring that they restate into law our existing freedom of religion. We have seen our country turn against our very own foundational morals standards. So, the big picture, Christians I believe will be increasingly persecuted in the public realm both verbally and in the media, but also politically through laws that will be enacted against us. As for being subjected to actual physical death, such as at the hands of ISIS and other Christians who are suffering so greatly in the Middle East, will that be coming to America soon? I pray not. I pray that America will still stand as a bastion of freedom for all religions and where Christians can feel safe from religious persecution. What happens when the United States fails in protection religious freedom? I just don't see there's another nation in the world Christians can go to where they will be safe. I believe the loss of religious freedom is setting us up for the coming Tribulation period. At that time there will be nowhere in the world where Christians will be safe. 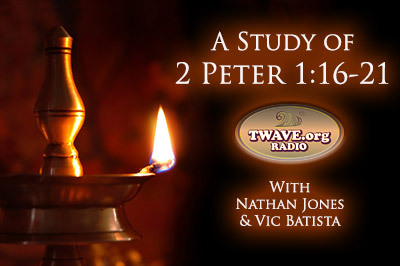 In the third segment of our study of 2 Peter 1:16-21, we'll look at how the Apostles got a glimpse of the divine majesty of Jesus Christ. As a believer in Christ, born again by the gift of faith, by the power of the Holy Spirit. You words ring true like the peels of a church bell. Yet, to those unsaved dying for ones faith means nothing! Their arguement is Muslims blow themselves up every day for their version of the true faith. While, we know different, their point is well made. I'm sure that Islamic history can dig up maryters of their early faith as well. Even Buddhist today set themselves on fire as an other example. To us, who are in Christ, we hold what you said as truth and can feel it's truth by the Holy Spirti. But, how do we address the aforementioned position of unbelievers? While Christianity is salvation by grace with God doing all the works, all other religions are dependent on a works-based salvation. It's what and how much they do that matters in getting to Paradise/Nirvana/Ascension. Works are what so drives Muslims and others to do what they do according to their religious teachings. For, no works means going to Hell, endless reincarnation, or whatever dire fate they most fear.